The dial is in the form of a pair of dividers. On the hinge is a compass (needle and glass missing), with cover (now detached) engraved with decoration. The obverse faces of both arms of the dividers is engraved with the hour lines for common hours, divided to the half-hour, from 3 to 7 and from 5 to 9. On the same side of both arms is the signature and date 'CHRISTOPHORVS SCHISSLER ME FECIT AVGVSTE ANNO ? 15 ? 58 ?' and on the other arm 'HOROLOGIVM HORIZONTALE AD ELEVATIONES POLI ? 47 ? 48 ? 49 ? GR:<ADVVM>'. The lower part of both arms is engraved with dotted arabesque decoration. The reverse side of the arms is engraved with a scale of Augsburg inches (31/32 or 0.975 of a modern English inch). On one arm the inches are divided from zero to 6 to 1/2, 1/4 and 1/8 and numbered from 1 to 6. On the other arm they are divided from 6 to 11 to 1/3 and to 1/5, numbered from 7 to 11. The hinge is decorated with a flower. The dial, when in use, rests on the hinge on the other side of the compass and on two bun feet at the end of the dividers' arms. Two transversal arms can be folded and the upper of them is engraved with hour lines from half nine to half two, divided to the half-hour, numbered from 10 to 2 by one. The gnomon is missing. It was probably fixed to the square hole on the smaller transversal arm and on the compass box. 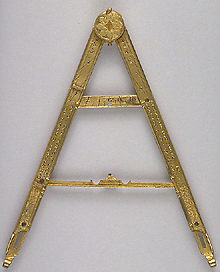 On one of the dividers' arms are two U-shaped brackets, the use of which is unknown. The lower piece is lined and has a decorated profile. The ends of the arms pull out on sliders beyond the dividers' edge, and end with hooks. The dividers are kept in a fitted leather case, lined in green. The instrument was bequeathed by Octavius Morgan in 1888 and is described in F. A. B. Ward, A Catalogue of European Scientific Instruments in the Department of Medieval and Later Antiquities of the British Museum (London, 1981), p. 86, no. 240.